Diagrams: This model is not diagrammed. If it is one of mine, I have not had the time to draw diagrams. In other words, instructions are not available. Volkswagon is a major sponsor of the Tremblant International Blues Festival. 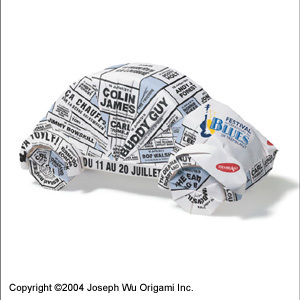 For their 2003 campaign, I folded an origami version of their new Beetle.